Discussion in 'General Dog Forum' started by thedogsbeforetime, Mar 21, 2018. The female to the waiting list I'm on goes into season next month! What on Earth! You can tell I've been busy! I've been on the waiting list since last year, and decided yesterday to check messages with my breeder, and was like....wait a minute...we possibly could have puppies in 3 months. Real, live, born puppies. Which means two months later I'd have a puppy. It seems like a long time away still, but I didn't even know we were at this point already!! Especially talking last year about how long the wait for her to be bred even was going to be! 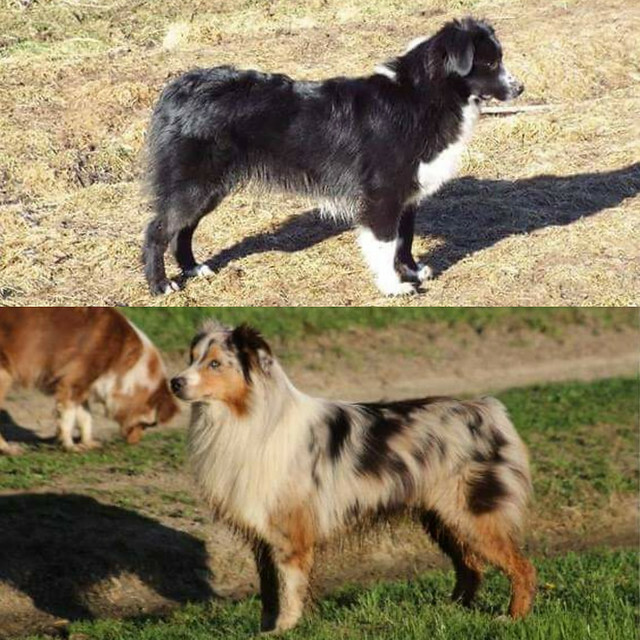 Fingers crossed for a breeding prospect....and not that I totally care about color...but this pair produces black bi colors, and that is what I want! The breeder will hold back the puppies who look to be breeding quality, and as they grow, I will learn who is coming home with me! If this litter doesn't have a prospect, I may have added myself to another pairing I like as backup. Soon I'll need to be signing up for puppy classes, and show classes, and having all my ducks in a row. arealhuman, Violet Turner and leashedForLife like this. ... & the most-experienced start making new friends, & expanding their social circle. I hope U get all yer ducks in a row, & yer pup is everything U dreamt of, & more besides. Well all the best for you and your cute little pup and good luck and I hope everything goes as planed, and the pregnancy goes smoothly. are you breeding her also with an Australian shep? Will you please do a pregnancy and also puppy diary? I haven't been around too much these days! I've had my new addition a few months now, but he didn't end up coming from this breeding. She had a puppy still available from a previous breeding, and I was somehow able to make it work. The above pairing female, just didn't want to go into heat, haha! So the wait just kept going and going, and in the end, she didn't produce what I was looking for anyways - so getting my newest addition just happened to work out! Same breeder, different pairing - so works for me! I will have to make a thread somewhere and do some updating and sharing! arealhuman, Josie and leashedForLife like this.